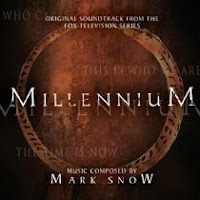 BACKTOFRANKBLACK.COM: MILLENNIUM MUSIC - MARK SNOW SIGNING EVENT! Fans of Millennium will no doubt be aware that a limited edition selection of music from Millennium was released by La La Land Records prior to Christmas. Any fan of Mark Snow's outstanding compositions will enjoy a chance to get their hands on some of, in my opinion, his finest work to date. In addition to our bringing this to your attention again I would like you to bring your attention to an event that has recently been announced at La La Land's website. La-La Land Records and Dark Delicacies invite you to meet, and get your CDs autographed by, composers Alan Howarth and Mark Snow. Mark Snow (X-FILES, SUPERNATURAL, GHOST WHISPERER) will sign copies of the new Limited Edition 2 Disc Set of his thrilling music to the acclaimed Chris Carter TV series MILLENNIUM, starring Lance Henriksen. The composers will sign more than one item, but one of the items must be a soundtrack CDs purchased at Dark Delicacies. CDs are available now at Dark Delicacies and will also be available for purchase at the signing. Can’t make the signing, but still would like to get autographed CDs? You can order CDs from Dark Delicacies to be autographed and sent to you! Check out their website www.darkdel.com for details! If you can make the signing please contact us and let us know all about the experience, we would love to hear from you. 2 Responses to "MILLENNIUM MUSIC - MARK SNOW SIGNING EVENT!" I got mine through the post, though I wish I lived closer enough to get one from the man himself! Pretty cool they are doing autographs by mail too!